So many of our customers tell us, “This will be our last home.” In fact, many log home owners do dream of their log home for many years. However, even the best laid plans change, and eventually your log home may be marketed. Even though it seems like the prenuptial agreement of home building, it’s an excellent idea to balance your current needs with your future requirements and the trends of home buyers in your market. 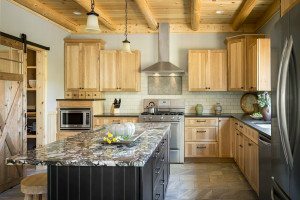 Treating your Katahdin Log Home like the investment it is will reap rewards down the road. This can be a trick question because tastes and attitudes change among generations. And the needs and desires of an imaginary future buyer can seem abstract in the present moment. But there are some basics that will help ensure your investment matures and provides a good return when the time comes to sell. Location— It’s the age-old real estate mantra, and it’s true: location is the most important feature and the one that cannot change. So when researching your land, it’s important to keep an eye toward the future. Take a look at the area and note how quickly it is developing. Are there lots of building permits being issued? Is the land use changing from rural to suburban residential? Are there large-scale real estate transactions occurring in commercial, industrial or residential? Check out the minutes from the local planning board of appeals and ask your real estate broker about what is happening in the area. Real Estate Taxes — Property taxes can drive buyers to other, less costly communities. If real estate taxes are high, note if it’s a short-term situation or a long term case of “champagne” tastes. Towns can have frugal or spendthrift natures, just like the people who live there. Check to see when the recent revaluation of properties were done and any new municipal expenses, like schools or infrastructure, that might hint at a higher mil rate in the future. Also ask what the municipality’s overall plan is—attracting low-impact, high-tax-revenue commercial business to offset property taxes is a positive sign. Theory of Relativity— What are the nearby or neighboring properties like? What view will future buyers have when they drive to view your home? Especially in rural districts, patchy zoning controls can lead to uneven and unfavorable neighboring property values. While some enjoy the diversity of a farming community, many more buyers may favor an area where homes are similar in size, character and value. If you build the largest and most expensive home in the area, your future buyers pool may be limited. Amenity Proximity— Buyers take a look at how near or far amenities are to your home’s location. And “amenities” can mean different things to different buyers. Nearness to daily needs, like grocery stores, pharmacies and shopping may enhance your property’s location. Good roads or access to state highways may make commuting to work easier. Good schools — one of the benefits of higher taxes in many cases— will make a home more appealing to families with children. Easy access to parks, beaches, mountains or attractions may be the most important feature for a vacation retreat. The next part of designing for value is reflected in the actual layout and design of the home. These design choices will reflect a balance of personal wishes with the potential for enhanced resale value. Invest in Space — Generous room sizes, good flow, and open feel are styles that appeal to most buyers, and make for a comfortable home. Make sure there’s a balance between public areas —kitchen, great room, decks and porches— and the private areas of bedrooms and baths. A grand main level loses buyers when they ascend to undersized or cramped bedrooms. If it can’t work comfortably as a bedroom, the space is best merged with another room. One way to gauge a good room size is to measure rooms that feel right and note those dimensions for incorporation into the plan. Bedrooms Make a Difference — As a general rule, most family-sized homes feature 3-4 bedrooms. This reflects the once-typical family size of two parents, and two to three children. Modern families are much more diverse in size and needs, but generally speaking, as the number of bedrooms increases, so does the value and more importantly the number of people who are in the market for that size of home. Again, balance is the key, keeping the number of bedrooms in line with the overall square footage of the home will maintain value. One trend to note is the expansion of the master bedroom. 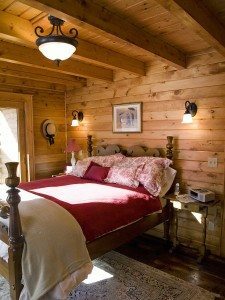 Many log home owners include a roomy master bedroom on the main floor with an en-suite bath, generous closet space and some spa-type treatment, such as a standalone tub. Splurge on Windows — It may seem like a utilitarian aspect to design, but high-quality windows add considerable resale value to a home. Katahdin uses Andersen Windows as a quality standard for their complete package. Upgrading to even higher efficiency or more features can enhance resale down the road. Some very exciting technology becoming available in windows, including self-dimming windows, automatic UV coatings and even self- or easy-clean windows that have glass impregnated with titanium to shed grime. Insulating Wisely— Even if your local code may not require it, extra insulation is never a bad call. An air conditioned home in a warm climate benefits from the energy savings of insulation just as much as a heated home in the cold. Another area that is gaining more attention is insulating interior walls to hinder both thermal and sound transmission. Most homes now employ zone heating, which has diminished effects if the barrier walls are not insulated. Another fact that is just as important as the insulation in a home is proper sealing of insulated areas, particularly in attic areas. The effect is called wind washing: moving air washes over the insulation and lowers the effectiveness of the insulation. Think of wearing a sweater on a windy day without a windbreaker to keep the wind out. Energy Efficiency — A very essential component to good resale value is selecting mechanical systems and appliances that offer the best efficiency for your specific needs. Select heating and cooling that gets the biggest bang for your energy buck, and explore fuel options that can save you money both now and in the future. A shift away from fossil fuel energy consumption is a trend that may lead energy efficiency homeowners away from fuel oil and toward renewables in many forms. With appliances, Energy Star® ratings make finding great appliances that only sip energy easy to do. Storage Rules— Extra and oversized closets are a super selling point for future buyers. Adding a single or his-and-hers walk-in closets to a master suite can up the appeal and make a bedroom more functional. Make sure to utilize spaces under stairs, knee walls and dormers for built-ins and extra storage. In kitchens, pantries can provide a tremendous amount of storage and can be an essential item for many buyers. 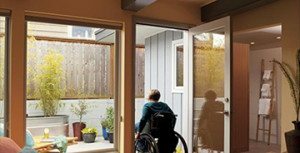 Universal Design — Employing universal design features that make life easier for seniors or disabled occupants are also a good option to include. How does it work? Some simple Universal Design features are wider doors (34-36 inches’ clearance), wider hallways (42 – 48 inches) and at least one no-step entrance. A no-step entrance can include innovative gentle ramps incorporated into entry porches or driveways. Include primary living on one floor: master suite, kitchen, laundry and living room. Use lever designs for hardware, like door handles, sink and bath handles. Incorporate different counter levels in the kitchen so that tasks can be accomplished at either sitting or standing positions. Some things can be retrofitted, should more specific disability needs be addressed, but with the structural modifications in place, it can be more easily completed. Once the structural and design parameters are considered to address as big a pool of buyers as possible, let’s take a look at features that are most desirable among buyers. In March 2016, the National Association of Home Builders (NAHB) released their latest study, Housing Preferences of the Boomer Generation: How They Compare to Other Home Buyers, which tracked buyer preferences across different aged populations. The survey included more than 4,000 respondents, covering multiple generations: Millennials (born 1980 or later), Gen Xers (born 1965-1979), Baby Boomers (born 1946-1964), and Seniors (born 1945 or earlier). The results are useful when examining the preferences of home buyers and amenities that each generation found desirable in their homes. Younger respondents now may translate into your buyers 5-10 years in the future. Size— Millennials and Gen Xers both desired larger homes of a median square footage of 2,375 and 2,315 respectively. Not surprisingly, Boomers and Seniors had their sights set on smaller homes of 1,879 and 1,791 square feet respectively. It is interesting to note as well that the younger two groups wanted homes larger than their current homes, while the older group wanted slightly smaller homes. Bedrooms — Nearly half of all respondents want three bedrooms, but 40 percent of the younger homeowners wanted 4 or more bedrooms. Single-level living —Most homeowners (64%) signaled they preferred single story but the trend was much stronger among the older homeowners. On a related note, 68% of respondents wanted a washer and dryer on the first floor as well. Kitchens— A majority across age groups wanted an eat-in kitchen, pantry and a double sink. Bathrooms— 83% of respondents wanted a full bath on the first floor, and at least 75% wanted a linen closet and both a shower and a tub in a full bath. Insulation — 81% noted that installing more insulation than required was essential or desirable. Energy Star® — Respondents were strongly in favor of Energy Star® home ratings (88%), Energy Star® appliances (90%) and Energy Star ® windows (87%). Laundry — A separate laundry room was a desired feature across all age groups. Floors— Hardwood floors were also a popular feature, desired by 82% of homeowners. Electrical features — Both exterior lighting (90%) and ceiling fans (86%) were considered to be essential or desirable across generations. The survey also listed features that were most UNwanted. Topping the list for everyone —except seniors —was an elevator. Amenities like pet washing stations, day care centers, wine cellars, cork flooring on the main level, dual master bath toilets, wet bars and laminate counter tops all led the least-desirable list. One especially interesting least-desirable feature was high-density or cluster housing plans with 46% finding a lack of space a negative. If your dream home includes a wine cellar or dual toilets, by all means include them in your plans. Just note that fewer future buyers will consider those features as a plus. Finally, we felt that the alternative energy options now available deserved a special look. 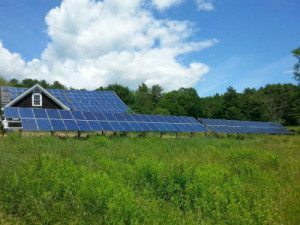 For many years, it was a questionable whether the installation of solar arrays actually increased the resale value of their homes. And as solar panel costs slowly came down and general acceptance of solar as a viable alternative, it appears that there are enough installations to answer the question objectively. One research study monitored home sales over larger samples than previously studied. The study tested home prices for premiums paid for solar panel arrays among similar homes. This was the first to sample from multiple parts of the country, including California, Florida, Oregon, Maryland, North Carolina and Pennsylvania. These analyses found premiums ranging between 2.5% and 6.4% of sale price for solar installations. These premiums were the positive difference in sale price of $10,000 to as high as $17,000, depending on the market. The cost of electricity, fuel oil, propane and other energy sources will continue to rise over the long term, despite short-term fluctuations. Owning one’s power through solar panels is becoming a much more normal and desirable feature in homes across the US. 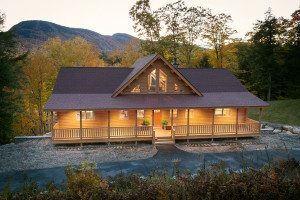 Ultimately a home owner designing a new log home has a wealth of options, and plenty of data now to make their home as comfortable as possible for the present and as marketable as possible in the future.